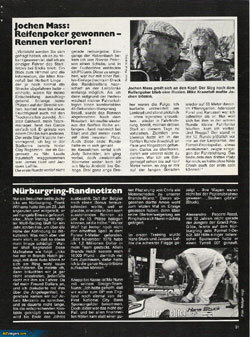 Following on from part 1 of this Niki Lauda special, below is a 13 page feature from an unknown German magazine. 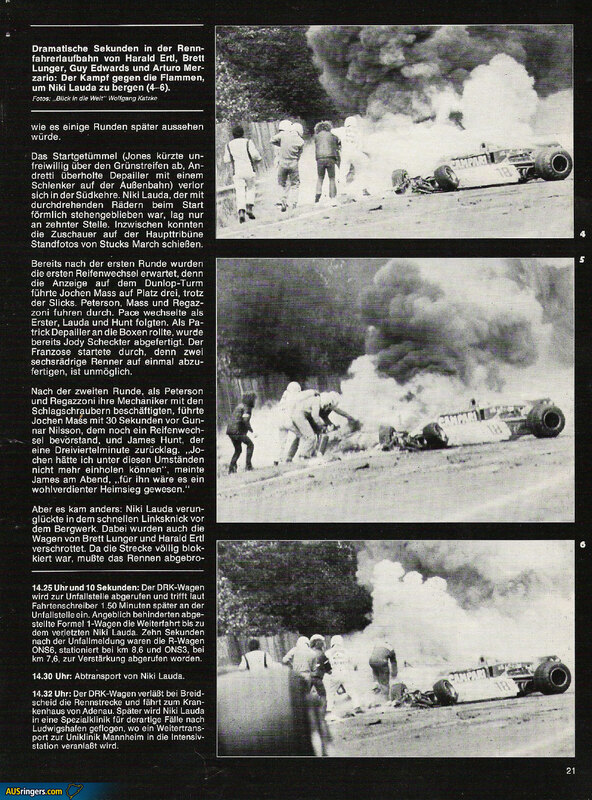 Some of the images contained within are quite graphic with a clearly bloodied and burnt Lauda captured on film. 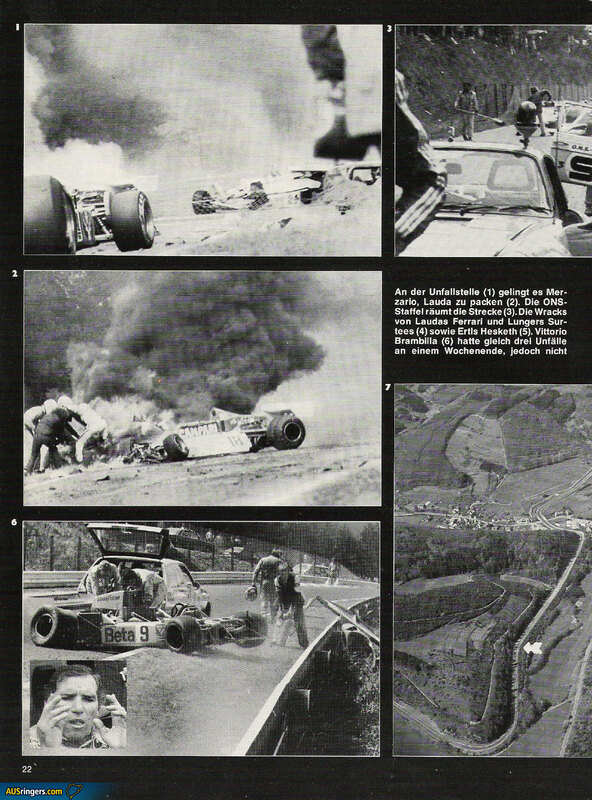 Also captured is the brave work of fellow drivers Brett Lunger, Arturo Merzario, Guy Edwards and Harald Ertl who came to the Austrian’s aid at the crash scene. 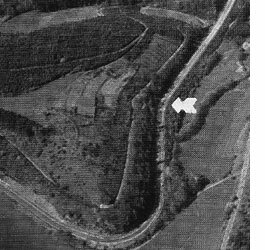 An aerial photograph shows where Lauda’s impact happened, which was at the left-hander in between Ex Mühle and Bergwerk. This corner has now unofficially become known as either Lauda-Linksknick (Lauda left kink) or, more graphically, the Grill Kurve in reference to the horrendous burns suffered by Lauda. Thanks for the images and translations go to Jesper Hvid and MinardiFan from the Fastlane website’s forum. 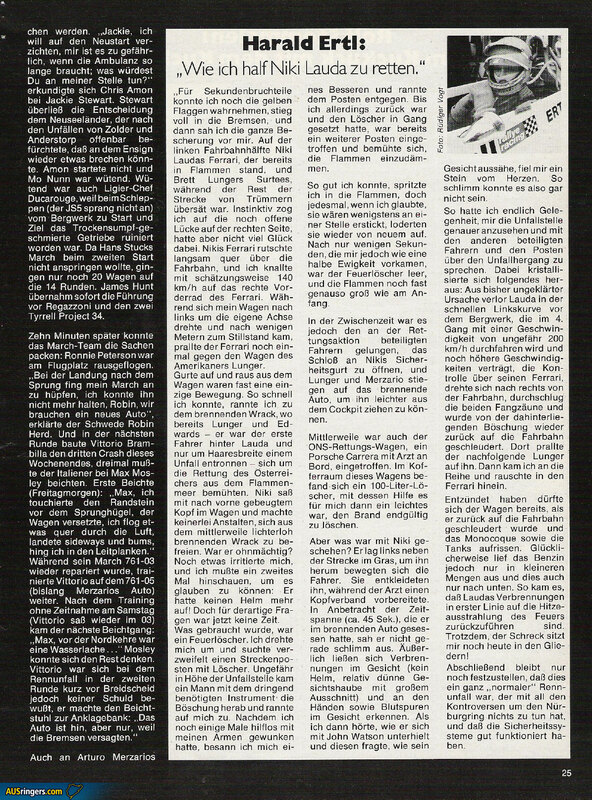 Three sections of the text have been converted to English, starting with the main article, the accident log and Harald Ertl’s account. English language photo captions have also been translated. UPDATE 12 April 2012: A recreation of Lauda’s accident has just been filmed for the Ron Howard film Rush, due for release in 2013. The anniversary event on the Nürburgring didn’t offer a reason to celebrate. 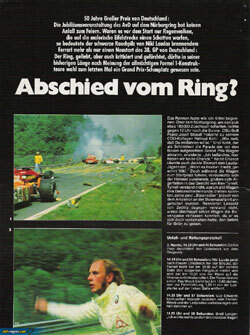 While it was only rain clouds which overshadowed the picturesque Eifel track at the start, the clouds of smoke of Niki Lauda’s burning Ferrari meant more than just a re-start of the 38th German GP: The Ring, beloved but also criticised and feared, had hosted—according to the almighty Formula 1 constructors—probably the last Grand Prix, at least in complete length. The race had started like a crime story: At 1pm the sun was still smiling above the Ring, which was crowded by 180,000 spectators. CSU [Christian-Social-Union] boss Franz Josef Strauß was joking with his CDU [Christian-Democatic-Union] colleague Helmut Kohl: “How nice that you want to drive with them” And Kohl, the patron of the event, paraded along the Grand Prix cars which were standing in front of the pits and answered: “I fear we won’t have a chance here.” No chance had Lauda’s challengers either, according to Jackie Stewart: “If it stays dry, Niki will win”. But while the cars drove to their starting positions, the clouds became darker and Ken Tyrrell’s face got angrier: Tyrrell didn’t understand why all the cars were able to drive their “Betonschleifen” laps, while his two sixwheelers were stopped by the red light at the end of the pitlane. Race director Leopold von Zedlitz didn’t understand how the cars were able to exit the pitlane at all, as it was him who was supposed to change the light to green. The result was a complete chaos at the starting grid, where officials with two different lists tried to tidy up the mess: “Where do I have to place my car?”, asked Alan Jones, “the man holding the sign with my name was just standing here, now he’s standing there.” Others had even more problems finding their grid position, as four of the sign-holding men were having a chat together. For Rolf Stommelen there was no sign existing at all. His 15th grid position, driven with the RAM-Brabham-Ford BT44B was topic of lots of discussions: The rules say that car changing was allowed if make and type were the same. “What’s the problem?”, asked Bernie Ecclestone some sceptics, “the make is Brabham, the type is Formula 1.” Rolf was allowed to start with his spare car (Martini Brabham BT45) from the midfield. He only practised the BT45 in the rain (8.02,3, a fantastic time to which only Regazzoni came anywhere near to) and would therefore not have been qualified. This lot was shared by Lella Lombardi and Henri Pescarolo, whose Surtees had chronical problems with the fuel injection. Huschke von Hanstein was shouting desperatly: “They’re still standing wrong, where’s Zedlitz?”, when rain was reported from Fuchsröhre, Breidscheid and the “Hohe Acht”. On the starting grid, clouds began to get closer as well. Hans Stuck, behind Lauda and Hunt in the second row, was worried, because you won’t get far with a broken clutch, with or without rain. 10km of the track is wet, according to the 13.40h weather forecast. Bernie Ecclestone moaned: “Too much chaos is going on here, let’s wait with the start for a while.” His Ferrari collegue Daniele Audetto (“it’s still dry, how could we already change tyres?”) had already proposed to Ligier team boss Ducarouge on sunday morning that every F1 team needed a lawyer due to all these protests and difficulties with the rules. Now Audetto also wished himself a weatherman. Jochen Mass had one, or rather several, whose forecasts were transmitted to him by Mike Kranefuß. “When the clouds are high in the air and a soft wind is blowing, there’ll be only a small rain shower”, think the experts of the Eifel weather. While all teams put on rain tyres, Mass stayed with the slicks, even though it drizzled at the start-finish straight as well. 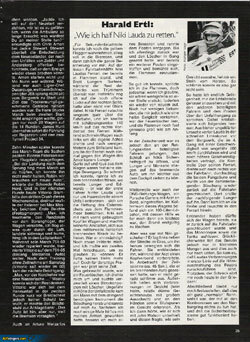 Bert Baldwin, Goodyear’s expert, had advised rain tyres after having completed a lap with Herbert Linge – a correct decision in terms of track conditions. But Bert didn’t know how it would look like a few laps later. 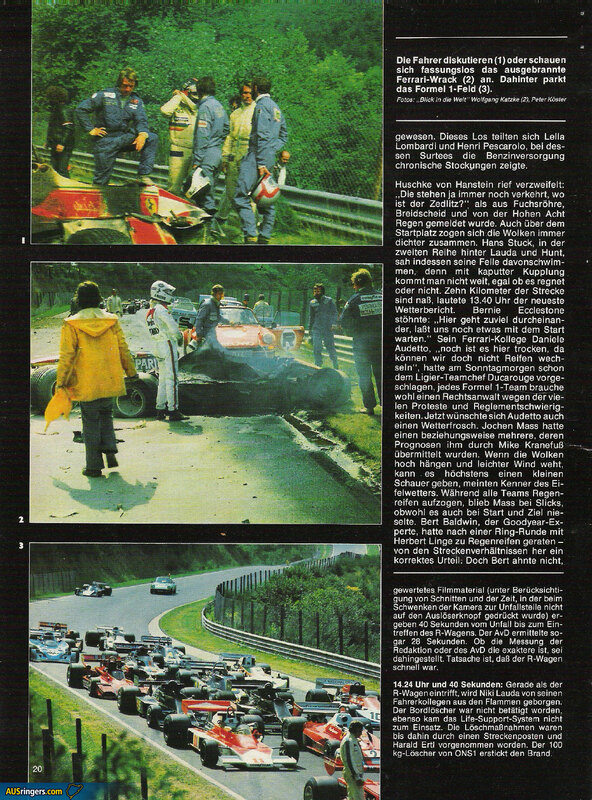 The mess at the start (Jones unintentionally shortcutted the green strip, Andretti overtook Depailler with a slide on the outside line) ended at the Südkehre. Niki Lauda, who almost stalled on the grid with lots of wheelspin, was only in 10th position. Meanwhile spectators on the main grandstand were able to take fixed-images of Stuck’s March. Already after the first lap tyre changes were expected, as the display on the Dunlop tower showed Jochen Mass on position three, despite his slicks. Peterson, Mass and Regazzoni continued. Pace was the first one to change, Lauda and Hunt followed. When Patrick Depailler rolled to his pits, Jody Scheckter’s tyres were already being changed. The Frenchman accelerated again, because working at two six-wheeled cars at the same time is impossible. After the second lap, when Peterson and Regazzoni kept their mechanics busy, Mass was leading Nilson, who had yet to pit, by 30 seconds and Hunt by three quarters of a minute. “I wouldn’t have catched Jochen under these conditions”, James explained in the evening, “it would have been a well deserved home victory for him”. But it wasn’t to be. 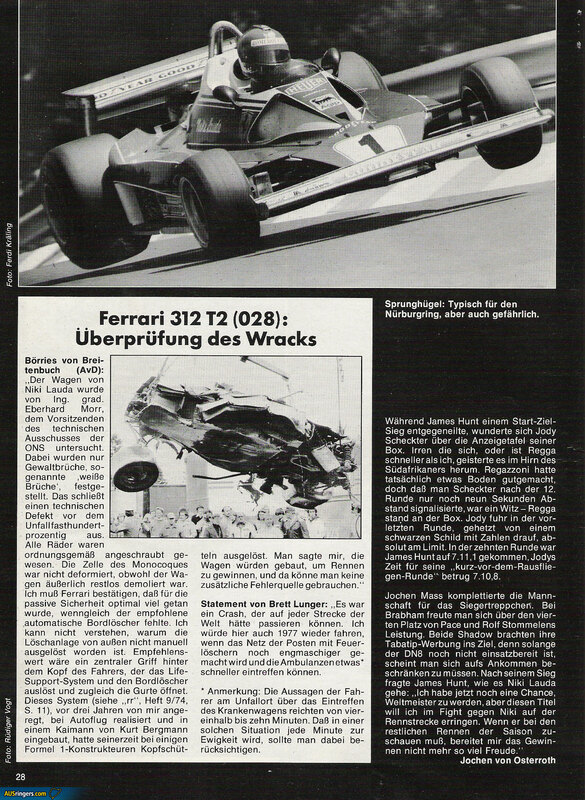 Niki Lauda crashed at the fast left hander before Bergwerk. The cars of Brett Lunger and Harald Ertl got wrecked as well. As the track was completely blocked, the race had to be stopped. “Jackie, I want to abandon the restart, it’s too dangerous in my opinion when the ambulance takes that long; what would you do at my place?”, Chris Amon asked Jackie Stewart. Stewart left the decision to the New Zealander, who, after the accidents in Zolder and Anderstorp, was worried that something might break at the Ensign. Amon didn’t start and Mo Nunn was angry. Angry as well was Ligier-chef Ducarouge, because the gearbox broke while the car was being pulled back to the pits (the JS5 refused to start up). As Hans Stuck’s March didn’t activate at the second start as well, only 20 cars started the 14 laps. 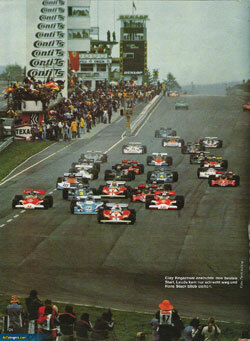 James Hunt immediately took the lead followed by Regazzoni and the two Tyrrell P34. Ten minutes later the March team could pack their things up: Ronnie Peterson had gone off at Flugplatz. “At the landing after the jump my March started bouncing, I couldn’t hold it any more. Robin we need a new car”, the Swede explained to Robin Herd. And in the next lap Vittorio Brambilla had his third crash of the weekend, three times the Italian had to confess to Max Mosley. 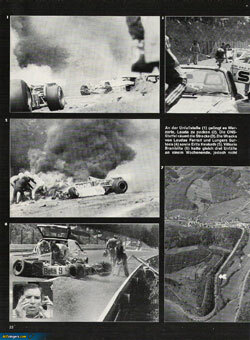 First time (friday morning): “Max, I touched the curb before the hill, the car got out of line, I flew diagonally through the air, landed sideways, and bang, I had gone into the barrier.” While his March was being repaired, Vittorio continued practising with the March 761-03 (Merzario’s car). After the non-timed practise on saturday (Vittorio had again the 03), he had to confess again: “Max, there was a waterslop before the Nordkehre.” Mosley could imagine the rest. Vittorio didn’t think the race accident in the second lap right before Breidscheid was his fault, though, he accused: “The car is broken, but only because the brakes didn’t work”. On Arturio Merzario’s Williams the brakes failed as well, but in contrast to his countryman he was able to retire the car in a softer way. When the field arrived for the first time (Hunt, Scheckter, Pace, Regazzoni, Nilson, Mass and Andretti), Patrick Depailler was missing: “Regazzoni had spun at Brünnchen, I tried to avoid him but that didn’t work.” The damage on the Tyrrell was luckily only small: damaged left front suspension. 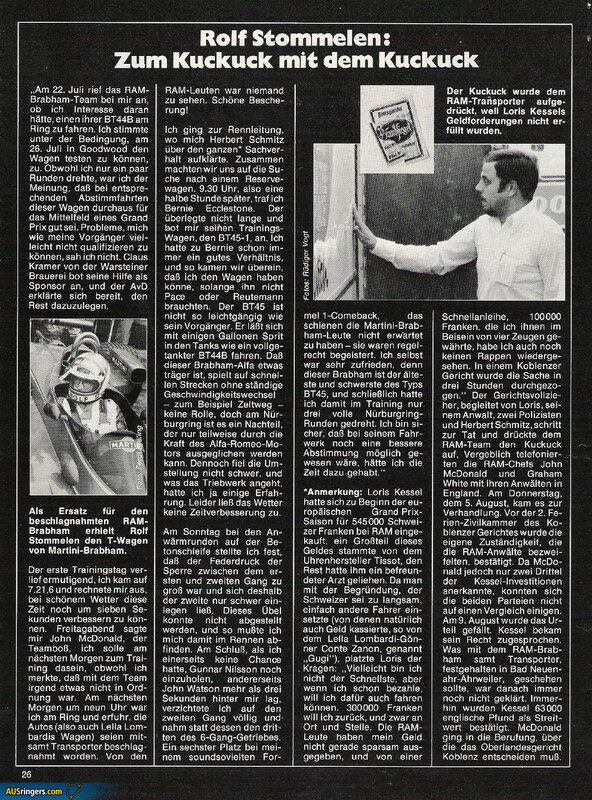 Regazzoni was able to continue (“with a car that didn’t handle properly at all”). His collision with the barriers at Karussell on lap 12 forced him to make a pitstop (new front wing) and cost him 4 points. 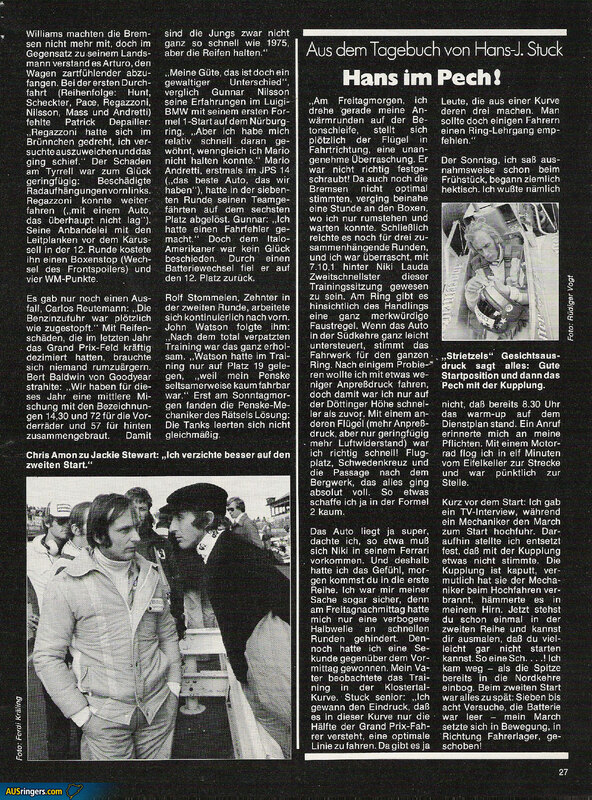 There was only one further retirement, Carlos Reutemann: “The fuel injection was suddendly blocked”. Tyre failures, which had decimated the field last year, were not an issue for anyone, though. Bert Baldwin from Goodyear was happy: “For this year we have developed a medium mixture called 14,30 and 72 for the front tyres and 57 for the rear ones. With these the guys may not be as fast as in 1975, but the tyres don’t break”. 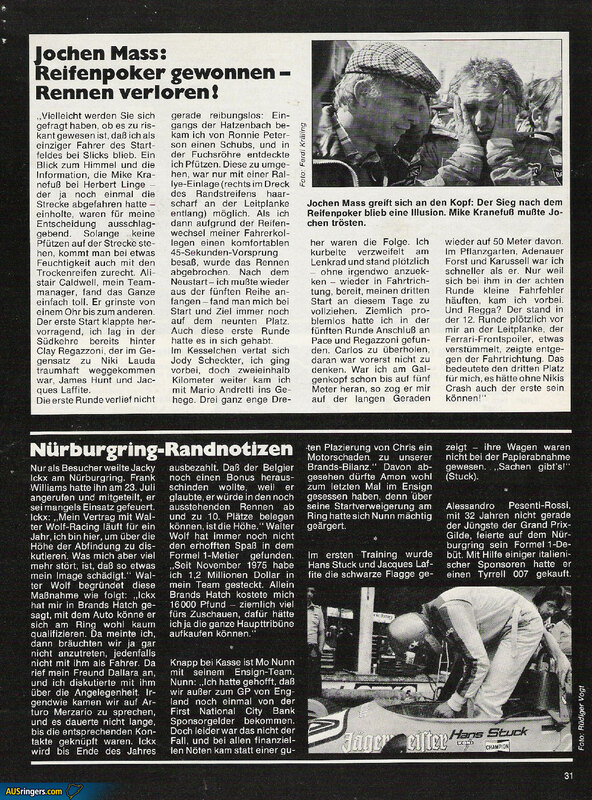 “My goodness, that was a difference”, compared Gunnar Nilson his experiences in the Luigi BMW with his first F1 start at the Nürburgring. “But I got used to it relativley fast, even though I wasn’t able to keep Mario behind me”. Mario Andretti, for the first time in the JPS 14 (“the best car I ever drove”) had overtaken his teammate on lap 7 for 6th position. Gunnar: “I made a driving mistake”. But there wasn’t much luck for the Italo-American, due to a battery change he dropped back to 12 position. Rolf Stommelen, 10th in the second lap, worked himself steadily through the field. John Watson followed him “After the completely messed up practice, this was quite satisfying”. Watson had only been 19th in practice, “because my Penske strangely was hardly driveable.” It took until Sunday morning until the Penske mechanics solved that riddle: The fuel tanks didn’t empty themselves equally. 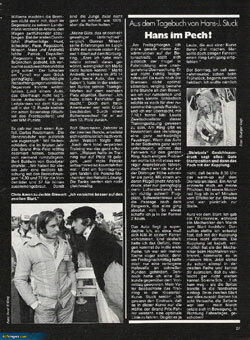 While James Hunt was going for a start-to-finish victory, Jody Scheckter was surprised about his pitboard signals: “Are they wrong or is Regazzoni faster than me”, he asked himself. Regazzoni did indeed catch up a bit, but to show Scheckter after the 12th lap only a 9 seconds gap was a joke. Regazzoni was in his pits. Jody drove his last lap, agitated by a black sign with numbers, on his absolute limit. In the 10th lap James Hunt managed a 7.11,1, Jody’s time for his almost-flying-off-the-track lap was a 7.10,8. 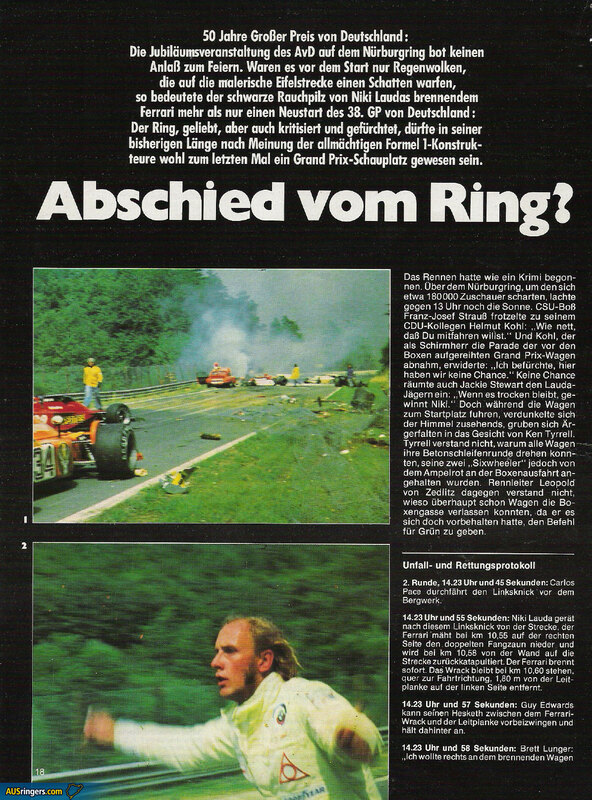 Jochen Mass completed the podium. 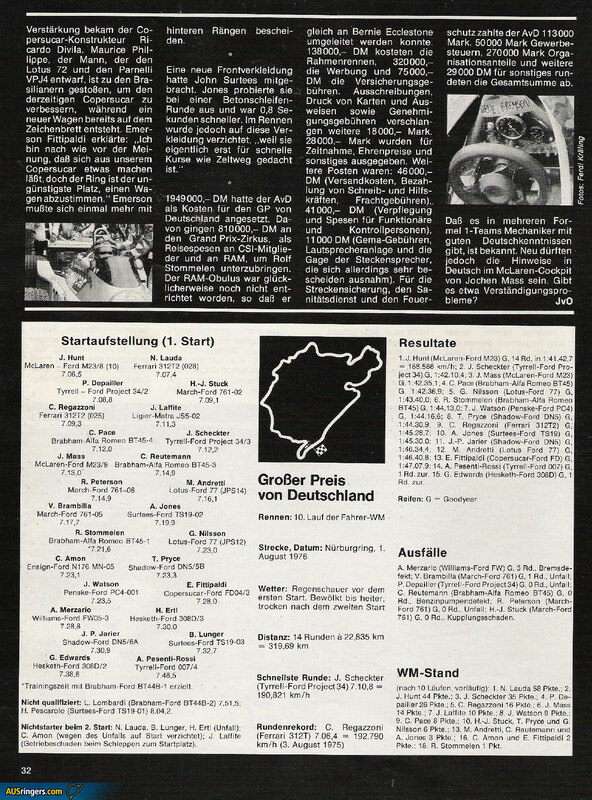 There was joy at Brabham because of Pace’s 4th place and Stommelen’s performance. Both Shadows brought their Tabatip-sponsors home, because as long as the DN8 isn’t ready they seem to have to be satisfied with finishing. After his victory, James Hunt asked about Niki Lauda’s conditions: “Now I’ve got the chance to become world champion, but I want to get this title after fighting for it with Niki on the track. If he has to watch the next races as a spectator, I won’t enjoy winning that much any more. Niki Lauda leaves the track at that point of the course, the Ferrari hits the armco at the right side at km 10,56 and gets catapulted back from the wall onto the track at km 10,68. The Ferrari starts to burn immediately. At km 10,60 the wreckage comes to a halt, diagonally across the track, 1,80m away from the barrier on the left side. Guy Edwards manages to squeeze his Hesketh through between the wreckage of the Ferrari and the barrier and stops right after. 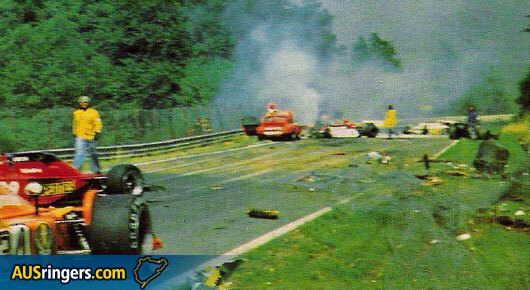 The track is blocked by debris and the wreckages of the Ferrari and the Surtees for Harald Ertl’s Hesketh. His car crashes straight into the inferno, spins and slides approximately 20m further before coming to a halt at the right side of the track. Three seconds later Arturo Merzario stops his Williams. Right after this report, the R-car ONS1, positioned at km 9,65 — shortly after the Breidscheid Bridge — starts driving on the safety band to the accident with yellow lights flashing. Horst Krausecke and Dr Schmeiser are in the car. Video footage (with cuts and the time when the camera was turned off while panning to the scene of the accident being taken into account) proves that there were 40 seconds between the accident and the arrival of the R-car. The AvD acquired even 28 seconds. It’s not important if the stopped time of the editorial office or the AvD is the correct one, fact is that the R-car was fast. Just as the R-car arrives, Niki Lauda is being rescued by his fellow drivers. The onboard fire extinguisher had not been used, nor had the life-support system. Until then, extinguishing the flames had been done by a marshall and Harald Ertl. The 100kg extinguisher from ONS1 quenched the fire. The DRK car is sent to the scene of the accident and arrives — according to the tachograph — 1,50 minutes later. Allegedly, parked F1 cars hindered the ambulance’s access to the injured Niki Lauda. 10 seconds after the report of the accident the R-cars ONS6 — positioned at km 8,6 — and ONS3 (km 7,6) were sent to support the other helpers. The DRK car leaves the track at Breidscheid and drives to the Adenau Hospital. Later, Niki Lauda is flown to a hospital in Ludwigshafen which is specialised on that kind of injuries. From there, he is transported to the intensive care of the Mannheim University Hospital. Niki was not wearing a helmet any more. But there was no time for these kind of questions. A fire extinguisher was needed. I turned around and searched desperately for a marshall with an extinguisher. Near the place of the accident a man with the urgently needed device came running down the bank and ran towards me. After having waved helplessly with my arms a few times, I thought better and ran towards the marshall. Until I was back and started the extinguisher, another marshall had already arrived and tried to quench the flames. I sprayed into the flames as good as I could, but each time I thought they were quenched at least at one place, it started to burn again. After only a few seconds, which were like an eternity for me, the extinguisher was empty and the flames still nearly as big as at the beginning. 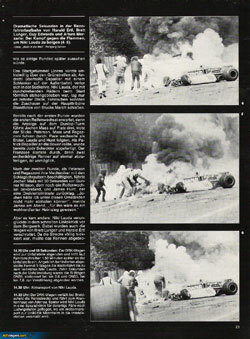 Meanwhile the drivers who were trying to save Niki had managed to undo his seatbelts, and Lunger and Merzario climbed onto the burning car in order to pull Niki out of the cockpit. By that time the ONS rescue car, a Porsche Carrera with a doctor on board, had arrived. In the trunk of that car there was a 100 litre extinguisher, with which it was easy to finally put out the fire. But what had happened with Niki? He lay on the grass next to the track, with the drivers moving around him. They removed his clothes, while the doctor prepared a head bandage. If you consider the time (approx. 45sec) in which he sat in the burning car, he didn’t look that bad. Externally, burns in the face (no helmet, relativly thin balaclava with big cutaway) and on his hands as well as blood in his face were noticable. When I heard him talking to John Watson and asking him how his face looked like, I was relieved. It couldn’t be that bad. Now I had the opportunity to take a closer look to the place of the accident, and to discuss the crash with the other drivers and marshalls. We came to the following result: for unknown reasons Lauda had lost control over his Ferrari on the fast left hander before Bergwerk, which is taken in 4th gear with a speed of around 200km/h (and which allows even higher speeds), slid off the track at the right side, struck the barrier fencing and was pushed back on the track after hitting the bank. There, the following car of Lunger crashed into him, then I hit the Ferrari. The car had probably already started burning when it was thrown back on the track and the monocoque and fuel tanks got ripped open. Luckily only a small amount of fuel ran out, and that only ran to the ground. That was the reason that Niki Lauda’s burns were mainly caused by the heat of the fire. Anyway, even today I’m still shocked when I think about it. In conclusion, I can say that this was just a normal race accident which had nothing to do with the ongoing controversy about the Nürburgring, and that the safety systems have worked well. 1. The ONS car has just arrived at the scene. 2. Hans Stuck warns the other drivers to slow down. 3-4. 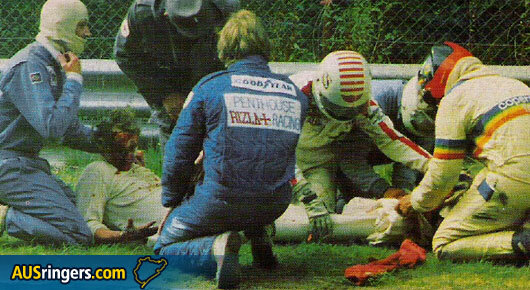 John Watson, Guy Edwards, Arturo Merzario, Brett Lunger, Emerson Fittipaldi and an ambulance officer look after the injured Niki Lauda. 5. Approximately five and a half minutes later, Niki Lauda lies on a stretcher of the DRK car. 1-2. The F1 drivers discuss or watch bewilderedly the burned out Ferrari wreckage. 3. The parked field of F1 cars. 4-6. 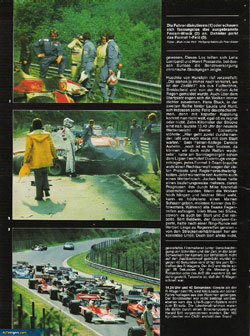 Dramatic seconds in the racing careers of Harald Ertl, Brett Lunger, Guy Edwards and Arturo Merzario: The battle against the flames to rescue Niki Lauda. 1. 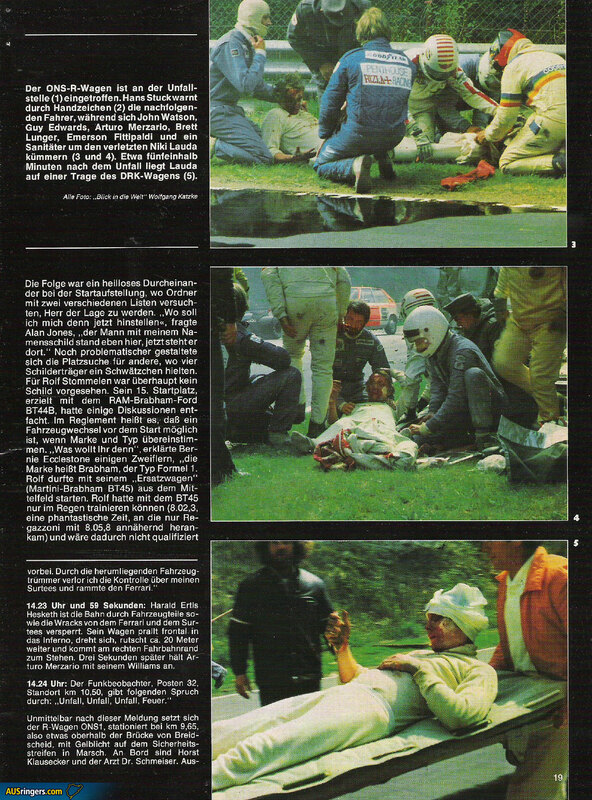 At the scene of the accident Merzario manages to grab Niki Lauda. 2. The ONS team clears the track. 3. 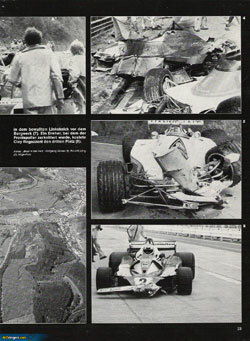 The wreckages of Niki Lauda’s Ferrari and Lunger’s Surtees. 5-6. 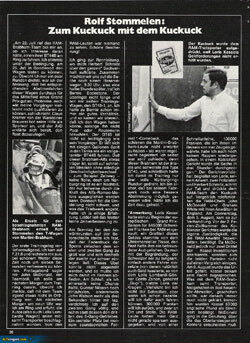 Vittorio Brambilla had three accidents that weekend, but not at that infamous left hand corner before Bergwerk. 7. The accident site, the left kink just before Bergwerk. 8. A spin which destroyed his front wing costed Clay Regazzoni third position. 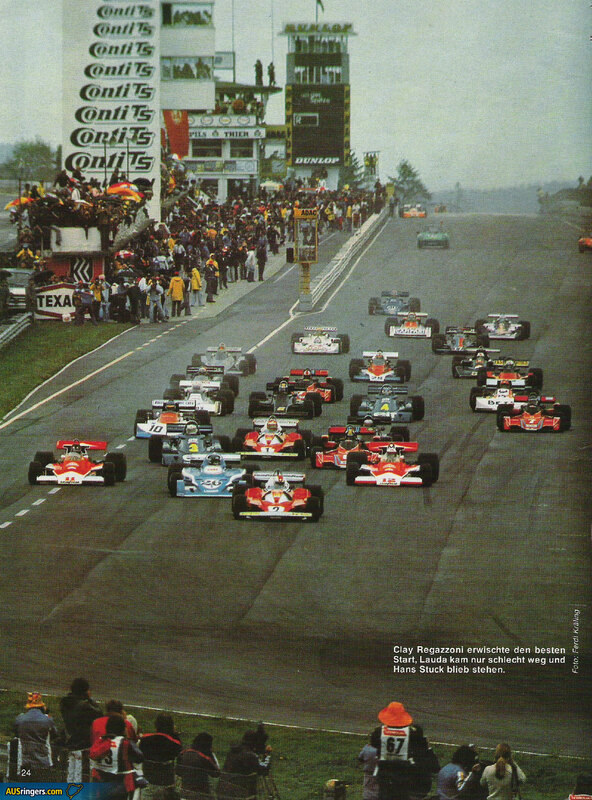 Clay Regazzoni had the best start, Lauda was slow off the line and Hans Stuck stalled. Jumps are typical for the Ring but dangerous. Images with thanks to Jesper Hvid from the Fastlane forum. Translation with thanks to MinardiFan from the Fastlane forum. Unglaublich, wie recht er damit hat! Bin fasziniert! It was incredible he survived and went on to challenge James Hunt for the title! 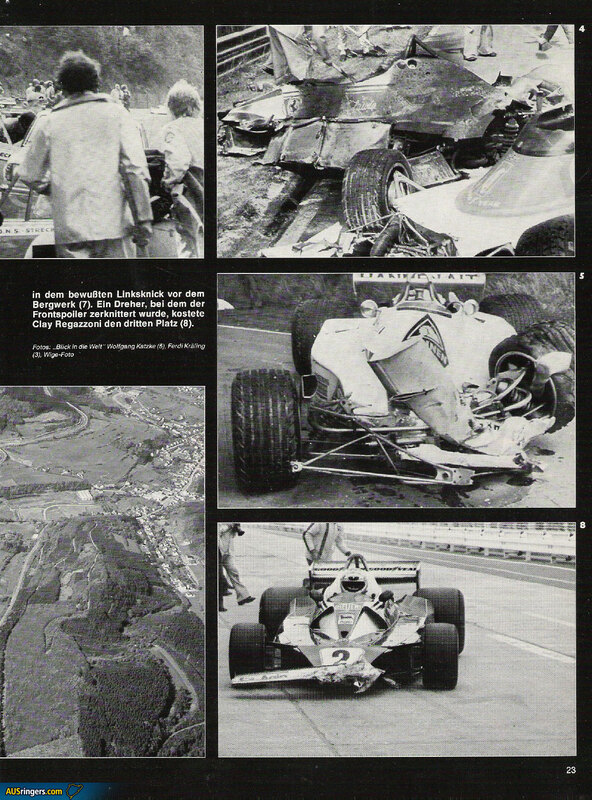 It is great that Niki Lauda was fortunate to take the experience from this accident. A lot of drivers in this era were not able to take the experience from their accidents. The experience as even Ayrton Senna described in Monaco is an important part of surviving an accident!